Billinghurst is an author, her most recent book The Armchair Book of Gardens: A Miscellany. Beautifully illustrated, it’s a compendium of garden commentary across cultures and centuries: excerpts from the Bible, botanical speculation from Pliny, and a survey of Mughal gardens, to name a few. Its cache of wisdom, whimsy, and wonder is compiled from Billinghurst’s three years of mining through libraries for horticultural gold. “It was fascinating. I put myself through a history of gardening, reading wherever I went. The Lindley Library in London is entirely devoted to gardening books,” she said. But make no mistake, Billinghurst is no armchair gardener: She’s a hands-on, activist master gardener with a hand in numerous local projects. She developed a Growing Community Gardens network for those who want to start community gardens. 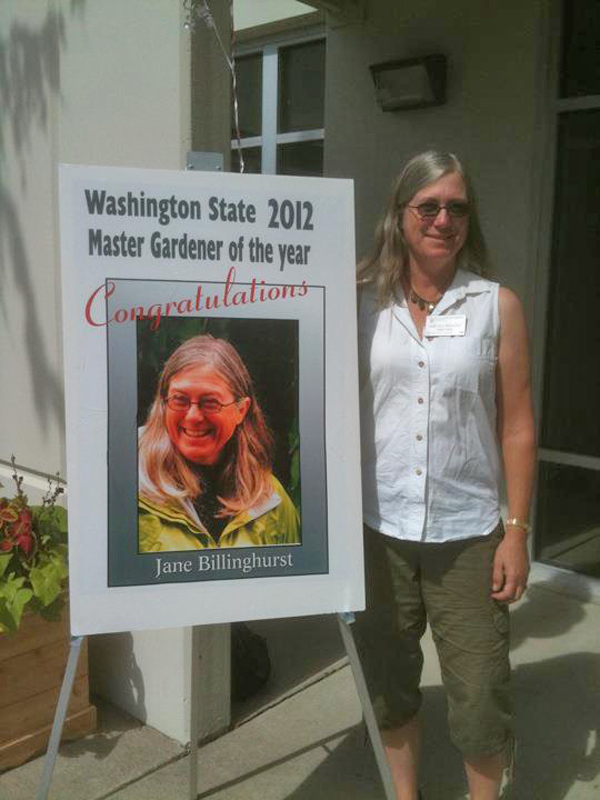 She’ll answer your questions in the Skagit Valley Herald’s Ask a Master Gardener column. She helped start Know and Grow, free monthly public classes at the NWREC. You can even hear her on KSER’s Skagit Talks radio show, sharing master gardeners’ signature sustainable research-based gardening practices. She knows what she’s talking about – she was named the 2012 Master Gardener of the Year. 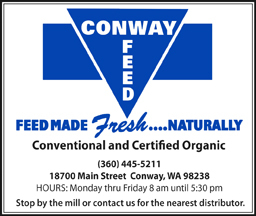 “What I’ve become very interested in lately is water quality,” Billinghurst said. She’s an advocate for 12,000 Rain Gardens, a Puget Sound initiative to install (yep, you guessed it) 12,000 rain gardens all across our region by 2016. “They will protect Puget Sound from 160 million gallons annually of dirty runoff that would otherwise pollute our waterways and ocean.” Supported by county conservation districts, stewardship partners, master gardeners, and more, the program provides free planning and a network of volunteers to install low-maintenance, drought- and flood-resistant gardens that filter stormwater before it becomes toxic runoff. Transition Fidalgo and Friends is an organization close to Billinghurst’s heart as well. 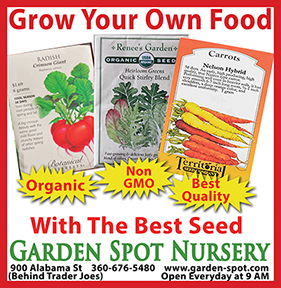 She helped begin the Eat Your Yard program, which encourages Anacortes residents to convert lawn to veggie patch. Veggie U, the series of popular annual gardening how-to classes, are held during winter and early spring in the Anacortes Public Library. “The most important thing about Veggie U is that we offer specific advice that’s helpful to our local climate. We have very wet winters, particularly here on the coast, as well as very dry summers. You can plant a garden that will thrive as long as you begin with the right seeds and the right education.” She and the Transition group also coordinated the opening of two community gardens: one at 29th Street, and one at Mount Eerie Elementary, where kids are learning to plant lettuce seeds sandwiched between two layers of wet paper towel. 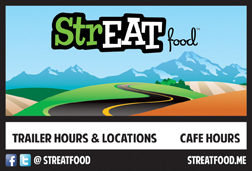 Billinghurst’s background in book publishing helped her pull together Serving the Skagit Harvest, a book created as a fundraiser for Transition Fidalgo’s community projects. 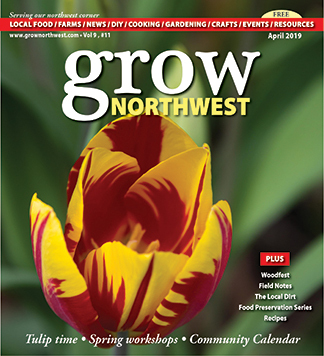 Recipes using Northwest garden produce, including some from local restaurants, are listed in seasonal order along with preparation tips, CSA advice, and more. 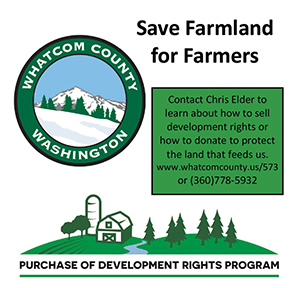 Fundraising comes with the territory for community organizers and environmental activists. As the Vice President of the Northwest Region of the Master Gardeners Foundation, this month Billinghurst is helping the Skagit master gardeners with their annual plant fair on May 11 from 8 a.m. to 2 p.m. Shoppers will find a smorgasbord of flowers, vegetable starts, and herbs, along with the advice of the master gardeners on hand. “The plant fair raises funds to keep our demonstration garden and outreach events going,” she said. Come early—the prices and selection are popular, and even though the master gardeners promise to bring 2,000 tomato plants, they’re sure to sell out before the end of the day. Was wondering if you are still teaching classes about gardening, specifically garden journaling? Looking for a September slot to be filled.